This new volume in the Feasting on the Word series provides an alternative to strict lectionary use for Advent, with six thematically-designed services for the four Sunday in Advent, as well as, Christmas Eve and Christmas Day. Four midweek services provide a supplemental study of John the Baptist to enhance the congregation's Advent experience. The resources in this companion are a combination of material from existing Feasting on the Word volumes as well as newly written material. 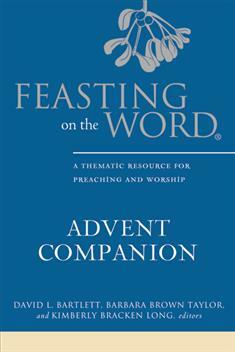 In keeping with other Feasting on the Word resources, the Advent Companion offers pastors focused resources for sermon preparation along with ready-to-use liturgies for a complete order of worship. All new material including hymn suggestions, Service of Hope and Healing, and children's sermon make this an invaluable resource for the Advent season.